Cyber threats are a constant concern in today’s digital world, and organizations are faced with constantly staying a step ahead of cybercriminals to prevent attacks. A master’s in Cybersecurity from St. Mary’s provides students with knowledge, skills and best practices on how to monitor, secure and safeguard an organization’s digital assets. This uniquely St. Mary’s program combines technical rigor with sound ethics and implications to the law. Choose from a master’s degree or a certificate (4 classes, 12 credit hours). 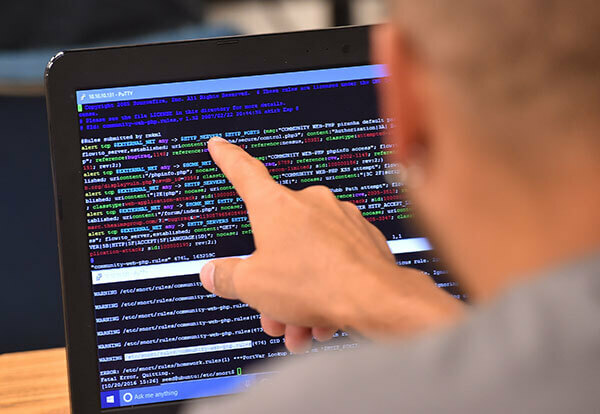 Students take courses in risk management, wireless security, computer forensics, mathematics for cryptography, and cyber law to get hands-on experience with protecting networks, computers, programs, and institutional data from attack, damage or unauthorized access. Project option: 33 credit hours. Five required courses, five elective courses and three credit hours of a capstone project. Thesis option: 27 credit hours of course work plus 6 credit hours of thesis work. Graduates with a Cybersecurity degree can provide expertise in the public and private sectors, benefiting the needs of large and small businesses, the U.S. government and military, contractors and research organizations. In San Antonio alone, the cybersecurity field is rapidly growing, with employers including NSA/CSS Texas; the 24th Air Force (Air Forces Cyber); the 25th Air Force (Air Force Intelligence, Surveillance and Reconnaissance); the U.S. Air Force Cryptologic and Cyber Systems Division; and numerous military contractors such as General Dynamics, Raytheon, and Booz Allen Hamilton located in the area. Additionally, Southwest Research Institute, USAA, Rackspace, Digital Defense and IPSecure represent a few of many private organizations that hire cybersecurity professionals. To be considered for admission to the Master of Science in Cybersecurity program, applicants must have a bachelor’s degree in Computer Science, Computer Engineering, Software Engineering, or a closely related discipline. Applicants who earned a bachelor’s degree in a closely related discipline, such as Electrical Engineering, Mathematics, or Physics may be admitted upon evaluation from the program director. The University catalog addresses admission requirements for the cybersecurity program.